Our Company provides channel pipe clamps at very less cost to our customers. This device is workde as a channel to handle the pipes. 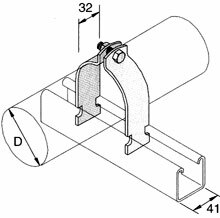 We provide a full variety of channel pipe clamps that is exactitude manufactured and is mainly utilized for fitting trim locks clamps on steel pilfer. These are intended with the lower U-strap so the repression cannot glide toward the middle of the scram to reduce the twisting. We offer these in adapted sizes and conditions as per customer's needs. The size and weight of each of the pipe clamp is totally different from each other.